Up at 4 a.m. to try and catch up on a little correspondence before I hit the road for the Nantahala Ranger District to search for cerulean warblers, I’m on the road by 5. I’ve found a neat short cut to get over to the national forest just above Nantahala School. I take U.S. 441 south towards Franklin, then head west on Sanderstown Road, a quick jog at the Little Tennessee and out towards the Macon County airport. Then I pick up Burningtown Road to Tellico Road and once the pavement ends the drive gets really interesting. I’ve dubbed last Saturday (May 19) “Deer Day.” Just as the pavement ended on Tellico Road, five nervous whitetails came from, seemingly, behind someone’s house, crossed the road in front of me, jumped the fence and headed for the woods across a small pasture. I found no ceruleans Saturday, but that’s not to say there were no avian surprises. I rounded a curve on a grassy Forest Service road as the morning light was filtering through the canopy and there, a couple of hundred feet in front of me was a turkey, sprawled in the middle of the road, wings akimbo. I slowed and stopped, trying to figure what this strange behavior was about, when she jumped up and a swarm of baby turkeys, fluttering and chirping began dashing this way and that. I sat in the truck for a few minutes to let things calm down, and then slowly approached the spot where mom had covered her babies. Most newborn wildlife have two major defense strategies – run or freeze. When I neared the spot I could see one baby chick frozen in an open area. As I knelt to entice the baby to join its siblings I almost stepped on another baby settled in a clump of grass. I encouraged the two to join their clan and searched the area before driving on. I finished my survey and headed back to Waynesville, arriving home around 12:30 p.m. The girls had company and they had already been busy that morning – greeting me with what they called a “big boy” of a garter snake. It was a couple of feet long. As I was retrieving gear from my truck something caught my eye. About 10-12 feet up in a dead hemlock right in front of the house were a pair of black rat snakes. And these were indeed – a big boy and a big girl between 5-6 feet long, doing their evolutionary duty and procreating. It was a gorgeous day and by 3 p.m. after another phone call to another friend, Mom, kids and I decided it was a great day for a hike. We headed up to Flat Creek Trail on the Heintooga Spur Road. Flat creek did not disappoint. Kids found salamanders, deer tracks, pig tracks and bear poop. 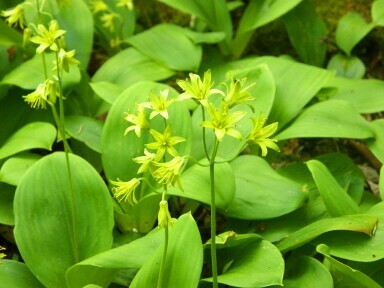 Mom and I enjoyed a healthy colony of yellow-bead lily as we kept listening for a waterfall. Finally we reached a sign saying we had traversed 1.9 miles and that Heintooga Road was .7 miles ahead. Well there was no waterfall and it was a little after 5 p.m. I sent Mom and the gang ahead towards Heintooga Road and I beat it back to the picnic area and the car. It was pretty good timing. They had had an adventurous creek crossing and came out on the road about five minutes before I got there. We loaded up hungry hikers, hit Soco Gap and headed to Maggie Valley for pizza and spaghetti. And that’s just a day in the life when you live in Western North Carolina.